Winter Tip: Foam, Dome, Drip! With just three simple steps families can protect themselves from costly extreme cold pipe damage. Visit our Pinterest page for more preparedness tips! When water freezes in a pipe it expands and can exert pressure over 2,000 pounds per square inch. This pressure is enough to rupture most any pipe filled with water. When the pipe bursts it can spill several hundred gallons of water per hour, resulting in the second most common cause of home insurance claims in America. FOAM: Insulate pipes exposed to the elements or cold drafts. For as little as $1 per 6’ of insulation, you can stop pipes from freezing and save energy. DOME: Placing an insulating dome or other coverings on outdoor faucets and spigots also reduce the likelihood of the water in your homes pipes freezing, expanding and causing a costly leak. DRIP: Drip your faucets, to you reduce the build-up of pressure in the pipes. Even if the pipes freeze, you have released the pressure from the water system reducing the likelihood of a rupture. If you are going out of town, and you suspect they temperatures will drop, turn off the water to your home and open all of the taps to drain the water system. This way you won’t return to a frozen, soggy mess. 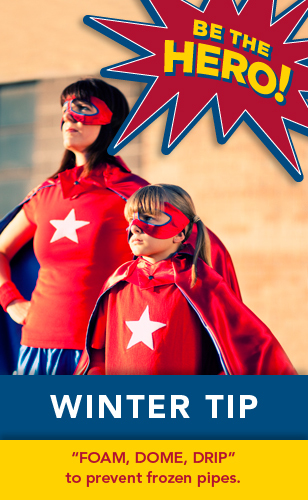 For more information on protecting your home from extreme cold conditions, visit www.flash.org. For severe weather alerts and mitigation tips, download FLASH Weather Alerts at www.flashweatheralerts.org. This entry was posted in Winter Weather Safety by federalalliance. Bookmark the permalink.